This post was written by me through an activation with HireInfluence on behalf of Howard Johnson Hotels. Although I received compensation for participating in the campaign, all thoughts and opinions are my own. 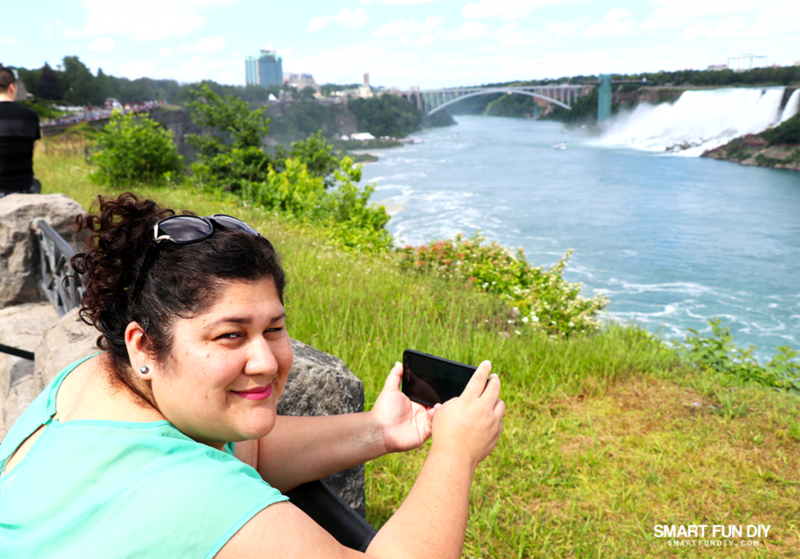 This summer we had a bucket list moment: we went to Niagara Falls! We had no idea what tour to book and what it was going to be like so when we arrived in Canada, we had no itinerary. 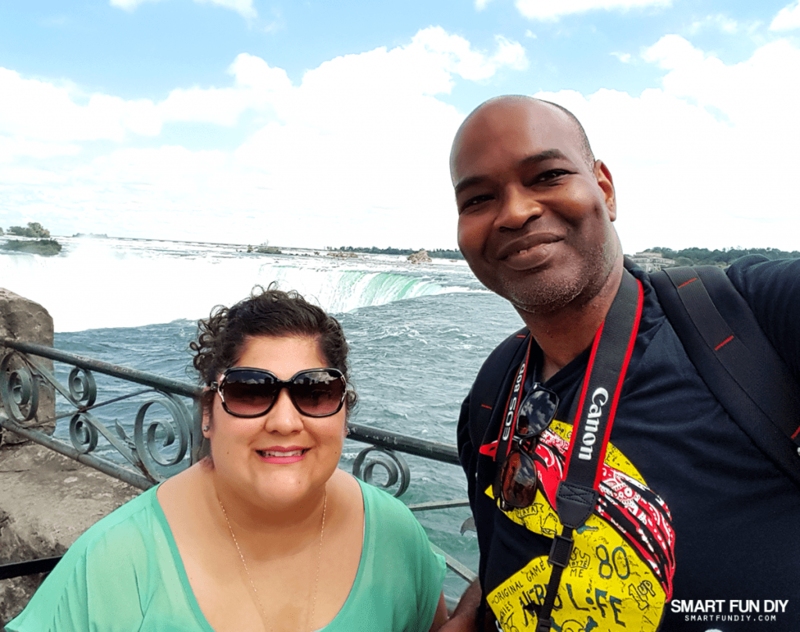 Our lack of planning had a silver lining: we discovered the affordable way to do a Niagara Falls trip on a budget. 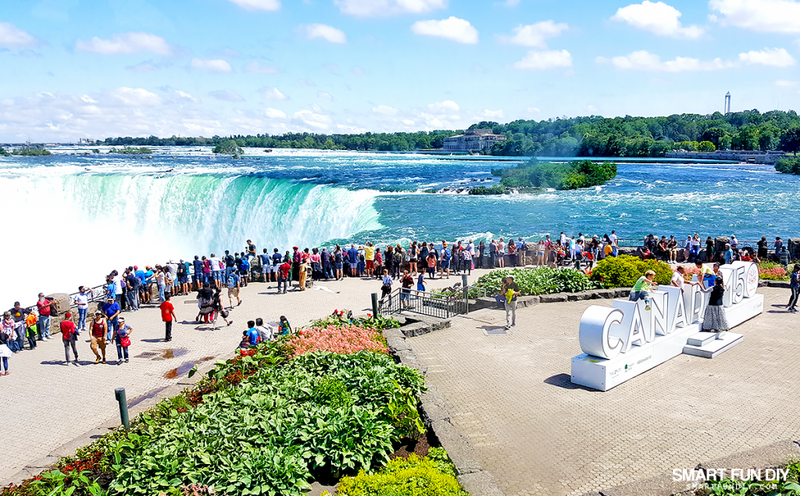 If you are researching a Niagara Falls trip, keep reading so you can avoid the mistakes we made … and see how we lucked out on saving hundreds of dollars on our trip! If I were to plan this trip differently, I absolutely would have booked a hotel in Niagara Falls for the night. 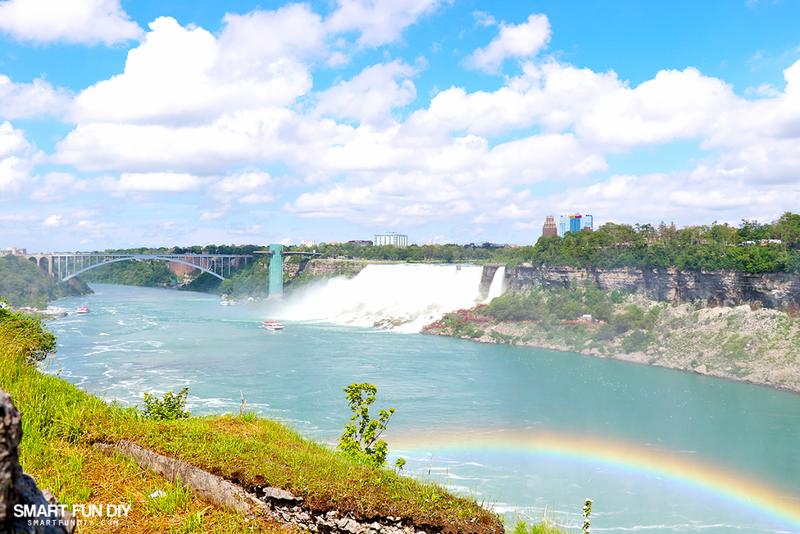 I didn't know what to expect at Niagara Falls but now I know that it's worth the overnight stay. Since we didn't stay in Niagara Falls for the night, we had to make the trip short and focused. 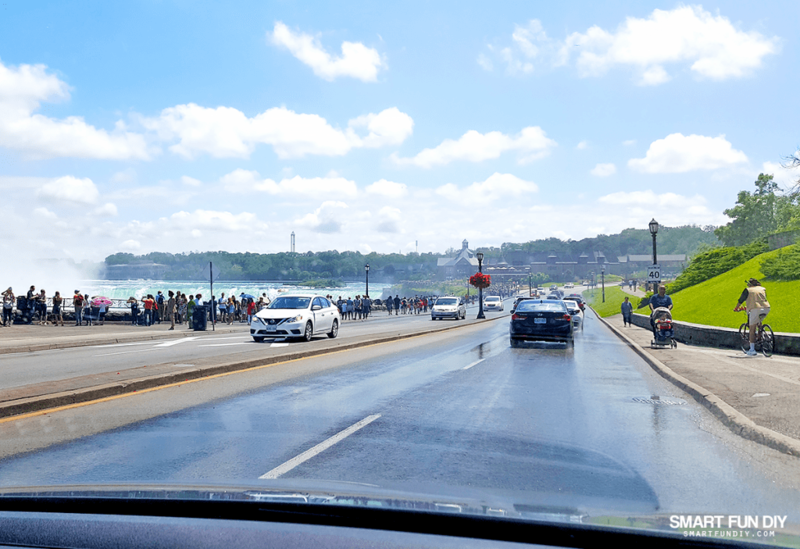 It would have been really great to cross the border back into the US and also see Niagara Falls from the US side but since we had to quickly get back to Toronto, there was no time to wait in line to cross the border. Plus, there's lots of shopping and places of interest in neighboring towns we could have seen given the extra time of an overnight stay. 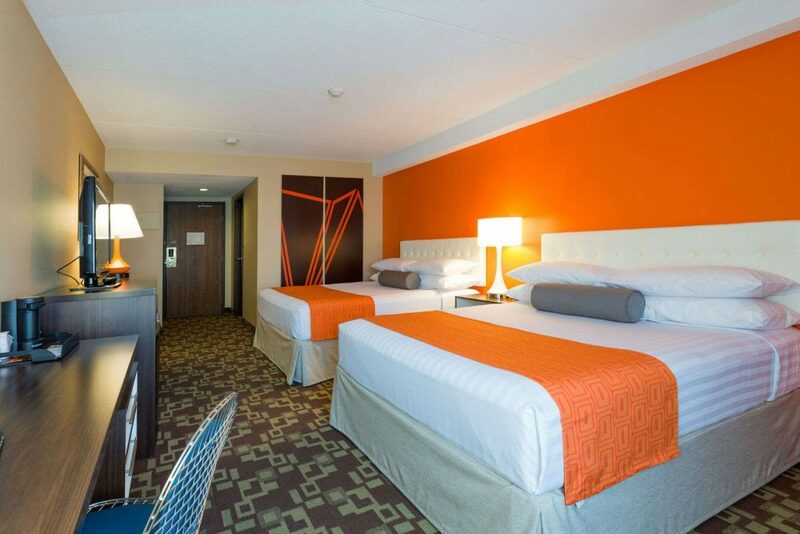 Booking an overnight stay in Niagara Falls is super convenient with Howard Johnson hotels. 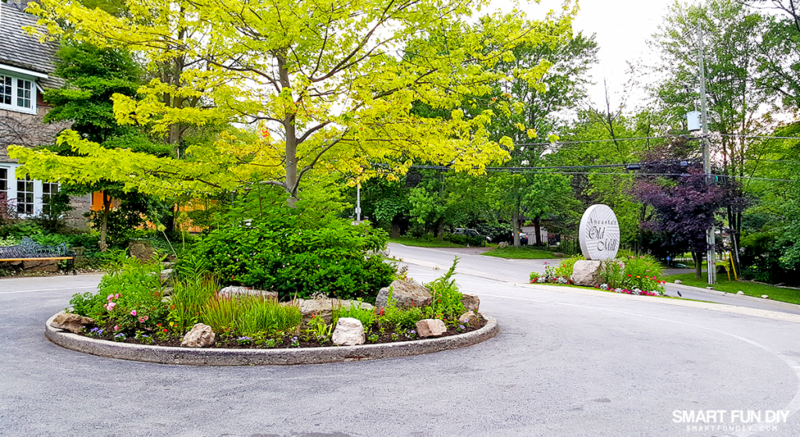 It was great to see the familiar HoJo brand in the area, a place where we know our stay will be fun for the whole family. I have fond memories of staying at Howard Johnson hotels as a kid in the 1980s … I vividly remember the iconic orange and blue decor! Look at how fun the rooms at Howard Johnson hotels in Niagara Falls are! We're planning to head back to Niagara Falls with the kids next summer. Did you know that kids stay free at HoJo and most locations are pet friendly?! 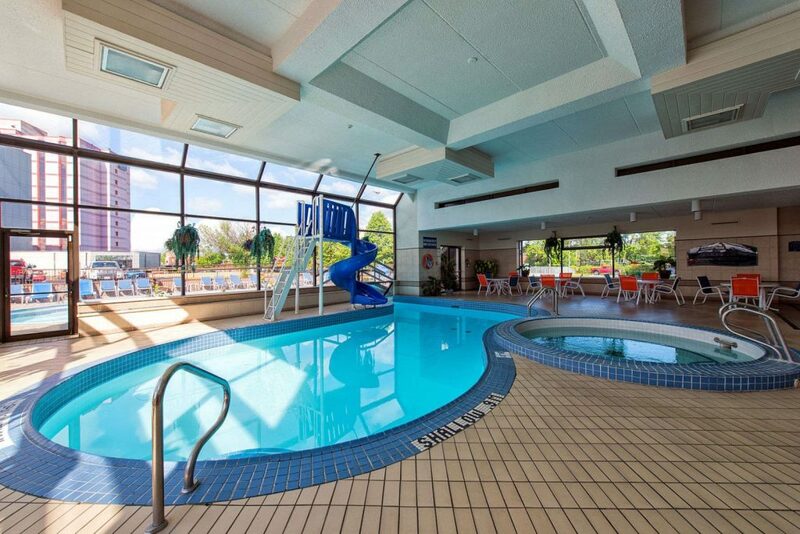 Plus Howard Johnson hotels are easy on the budget but still a high-quality, super fun experience for the whole family. Your hotel stay should be part of the adventure … not just a place you sleep. Stay 2+ nights and save 20% when you book at www.hojo.com/deals … head on over NOW to bookmark this link for your next hotel stay. While at the conference, I met up with another attendee whose husband had also joined her in Toronto. Just like my husband and I, they planned to go on a Canadian adventure after the conference was over. They told us all about their plans to rent a car to make the 1.5 hour drive south to Niagara Falls, where they were booked to stay overnight. The next day they planned to stay in another nearby town to check out a castle and some other sites, then head back up to Toronto for the Sunday antiques market. They invited us to join them on the ride to Niagara Falls but we'd have to figure out how to get back up to our hotel in Toronto that night. It sounded like a great plan! 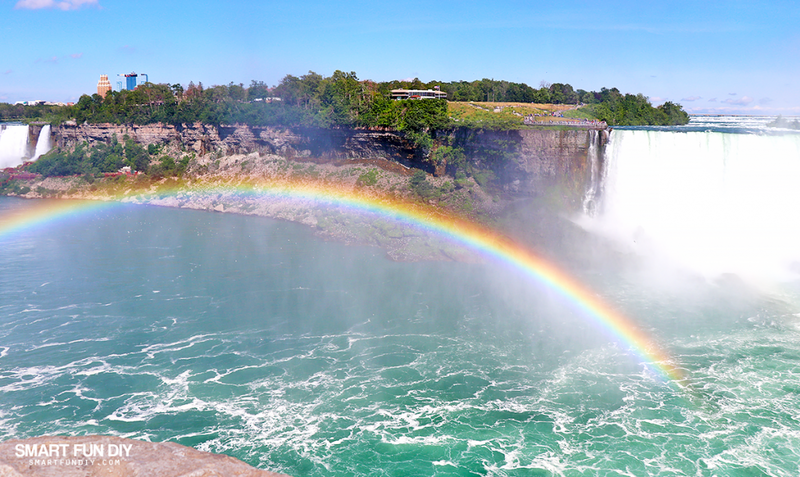 We had looked at bus tours from Toronto to Niagara Falls online and many of them were super pricey. We spent the evening looking at ways to get back to Toronto from Niagara Falls if we had taken the ride with them but all of the options were pricey or took a long time so we decided to rent a car on our own. We took a shuttle from our hotel to the airport where we grabbed a rental car. In Canada you can rent cars by the hour, rather than by the day like in the US, so we got the car for 12 hours. We hit the road, stopping at Tim Horton's along the way, and arrived in Niagara Falls just after noon. 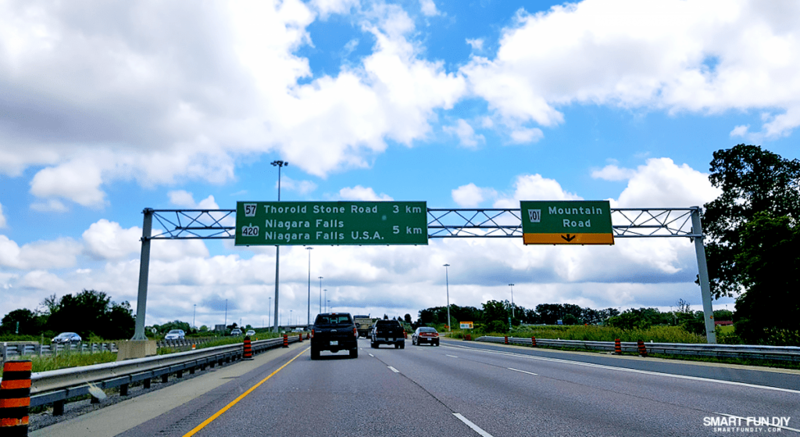 The drive from Toronto to Niagara Falls is mostly major highways so it was a smooth and easy drive. Driving in Canada is much like driving in the US and they have many of the same rental car companies as in the US. It's humid at Niagara Falls so it was a bit of a shock to this California desert native. On top of the humid weather, Niagara Falls generates a lot of overspray … to the point that it looks like it is always raining! 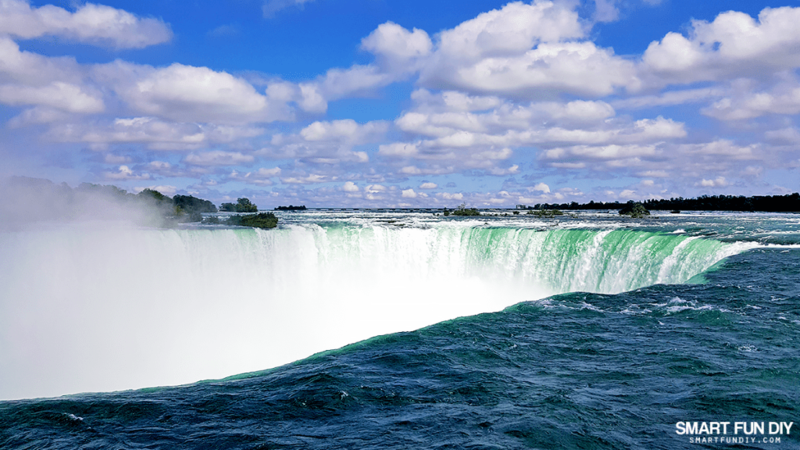 Xaver took this photo while we were driving on the Canadian side of Niagara Falls. That's all water from the Falls, not rain. I drank a lot of water but the heat can do a number on you if you're not careful. Since we planned our trip at the last minute, we hit the Falls right at the hottest time of day. If we had stayed in Niagara Falls, we could have hit the Falls in the morning and late evening when it was cool, spending the hot midday by this lovely pool at the Niagara Falls HoJo. 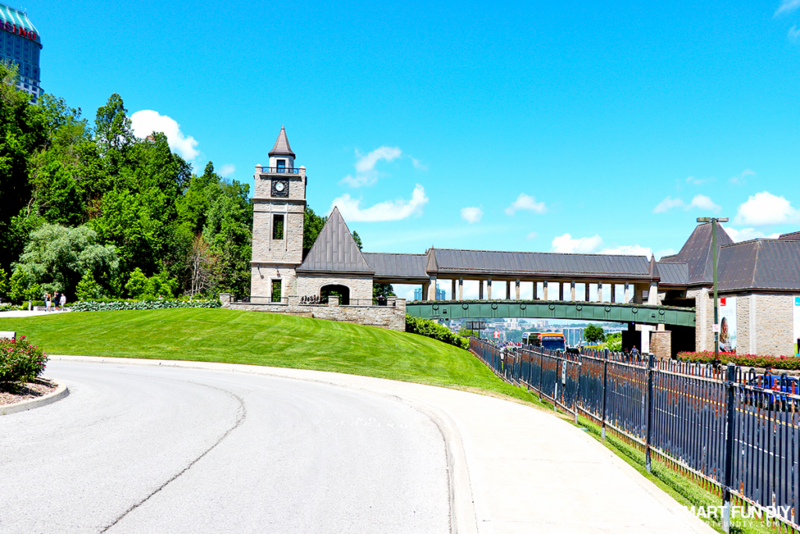 We parked right by the welcome center and the Niagara Falls Incline Railway. Parking is $22 Canadian which was about $18 US with the exchange rate at the time. The rate always changes so the price may be higher or lower when converting to US Dollars. I'm not gonna lie; I was pretty peeved at my husband Xaver for not booking a tour for us. Through a misunderstanding, we weren't on the same page about who was going to book the excursions on this trip. (Um, he was supposed to do it, k?) LOL The couple we met at the conference had scored some amazing mystery deal for tour tickets online and I was feeling really bummed that we were somehow missing out. Everywhere we looked for tours online, they all cost triple what our new friends had paid. Wait, you could just walk around and see the Falls without tickets?! 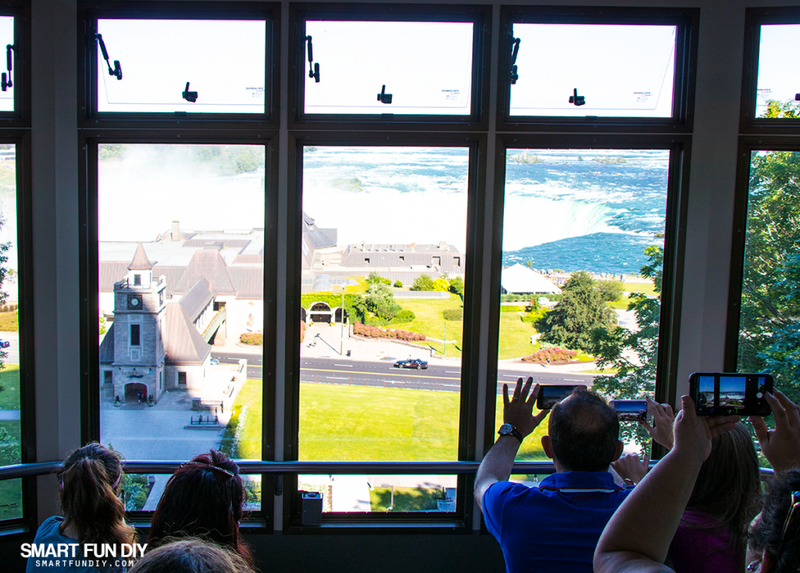 You don't need to spend ANYTHING to see amazing views of Niagara Falls. 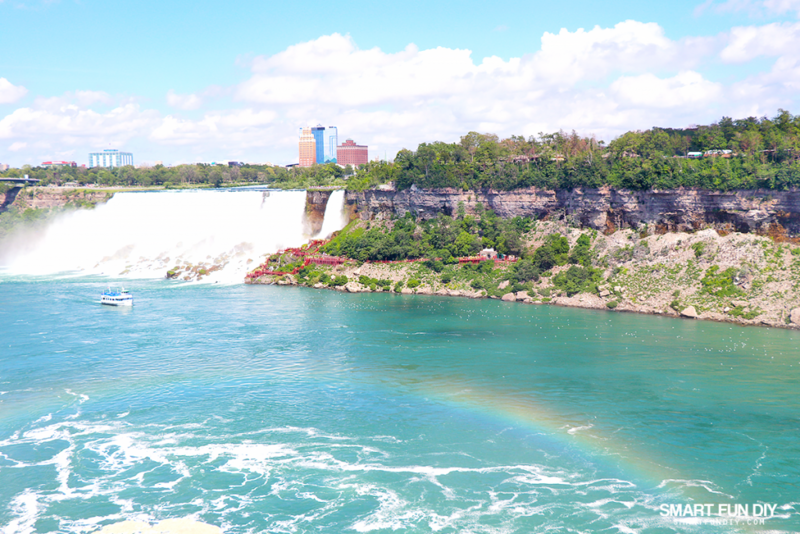 I had heard from people that the Canadian side is the best for viewing Niagara Falls and once we started walking around, I could see why. 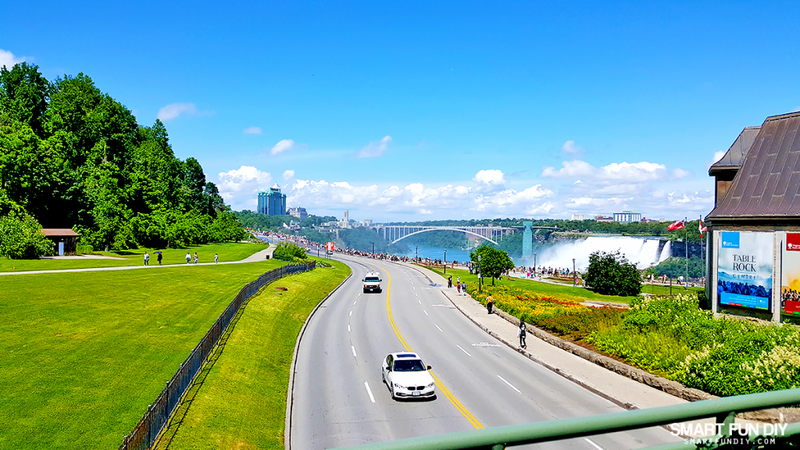 On the Canadian side of Niagara Falls, a long walkway extends the entire length of the Falls. 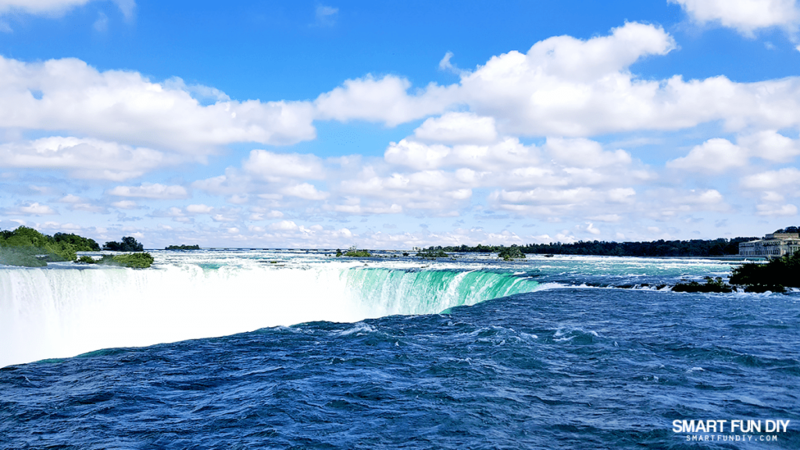 Since the water cascades down to the Canadian side, you get this view of the falls from top to bottom that you just can't see from the US side, which sits atop the Falls, not facing them. 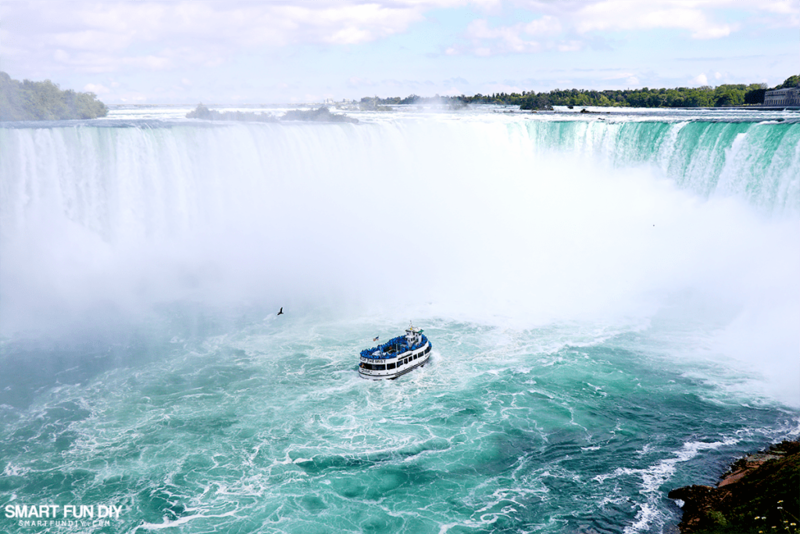 I've heard about how you have to take one of the boat tours at Niagara Falls if you ever visit. Well, I saw all I need to see about the boat tours to know that I didn't miss a thing! From the Canadian side, you can take a Hornblower tour. They give everyone a red poncho on the boat. Why do you need a poncho? Because you get SOAKED! I zoomed in on the boat riders with my phone and they are drenched and being blown all over the place from the wind down there. No thanks! (p.s. I show this on my vlog, which you can see at the end of this post). 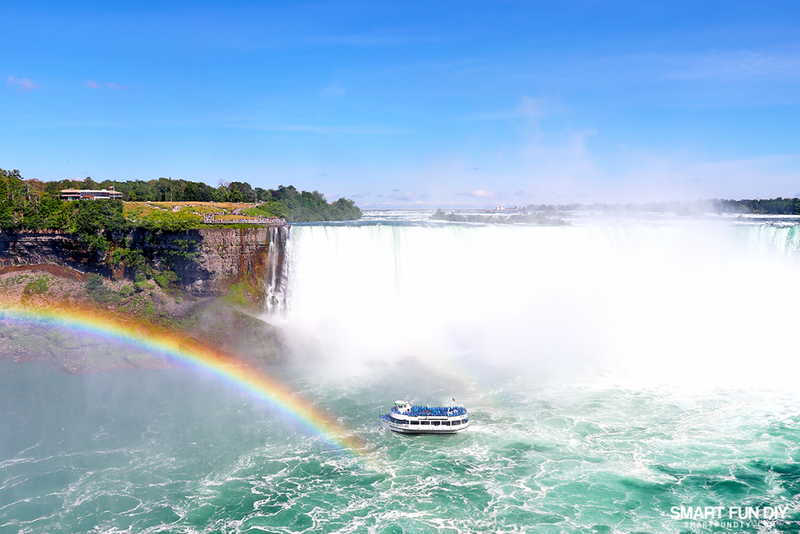 From the US side, you can take the Maid of the Mist tour. You get a blue poncho. Mist? More like BUCKETS of water! 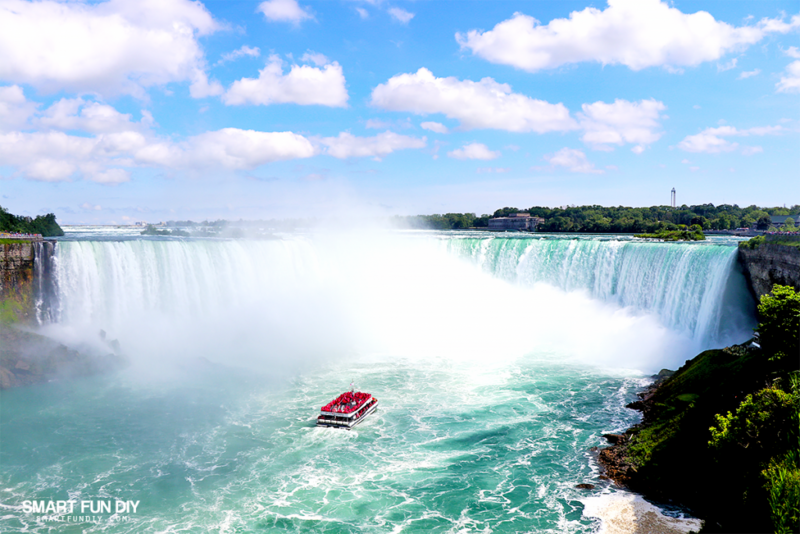 If boats aren't your thing, you can get drenched by going to the base of the Falls, from the Canadian side. Yes, people are paying for this! And if you like stairs, you can climb a bajillion stairs down the US side, in another poncho, to view the Falls from the base. All that red stuff in this photo that looks like scaffolding? Those are walkways and stairways filled with people in ponchos. I just looked at all that and thought, “I'm good.” I like my clothes DRY. Plus there are guys up here on the walkway selling ice cream cones and cold drinks. It doesn't get much better than this! Shopping tours … you pay for? On many of the tours we checked out, they had listed shopping as one of the attractions included on the tour. There are excellent gift shops in the welcome center that you can visit for free. And for more shopping, take a quick ride up the Incline Railway to the main strip through town. 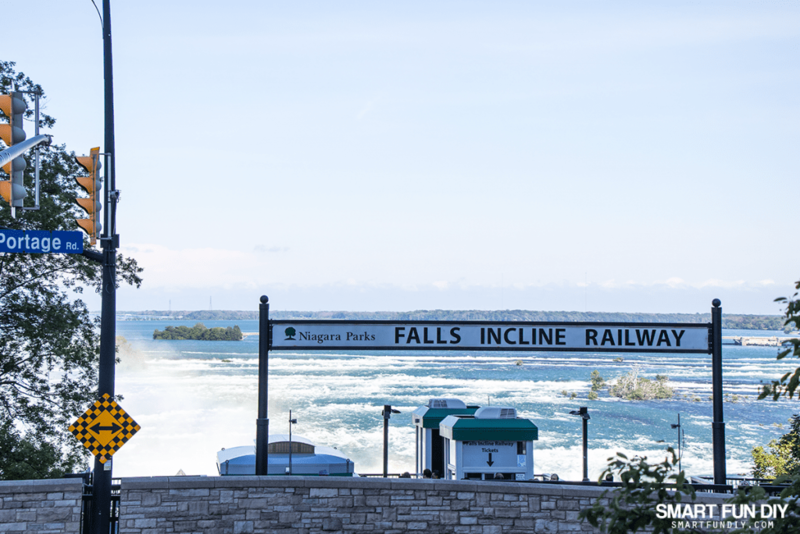 You can catch another breathtaking view of the Falls while riding the railway up the hill. Get out your smart phones everyone! 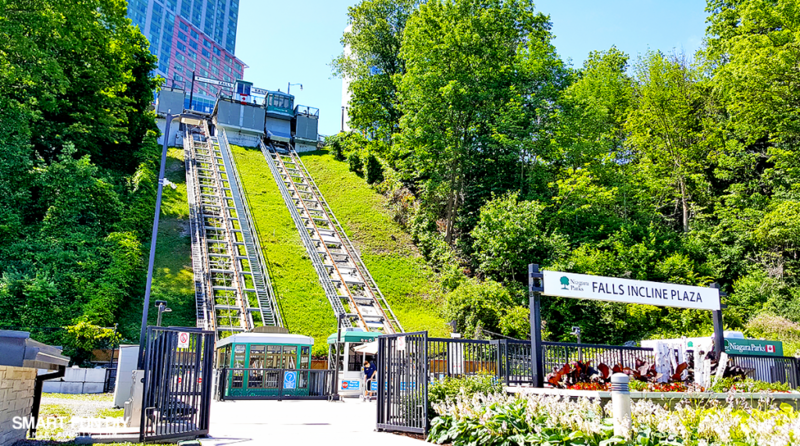 The Falls Incline Railway costs under $10 US per person to ride roundtrip. Again, check the exchange rate as it changes often. 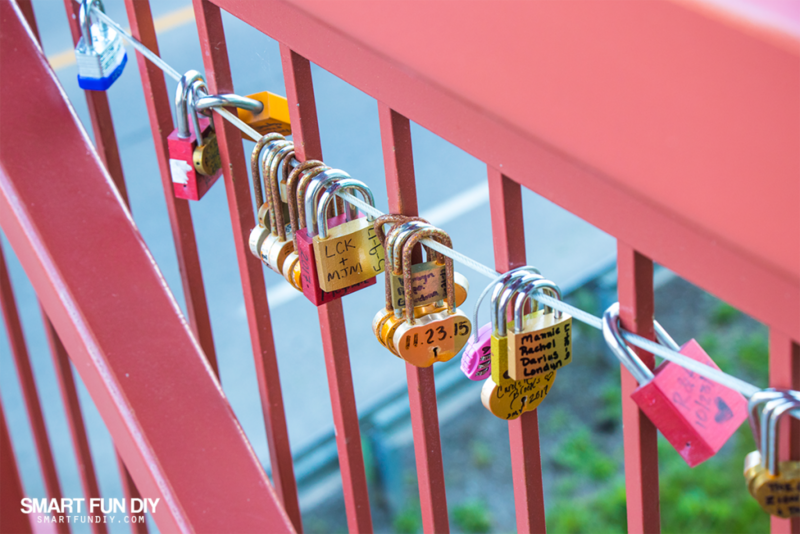 Walk across Niagara Falls' version of the Paris lock bridge and you'll be on your way to shops, eateries, and more. 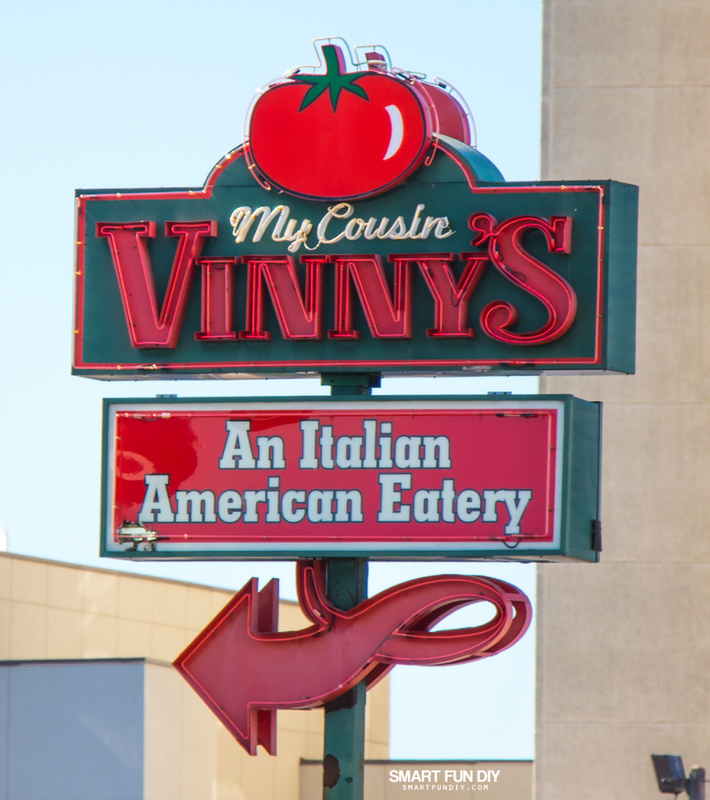 We even spotted My Cousin Vinny's! We didn't eat there but I had to grab a photo because my dad loves that movie. 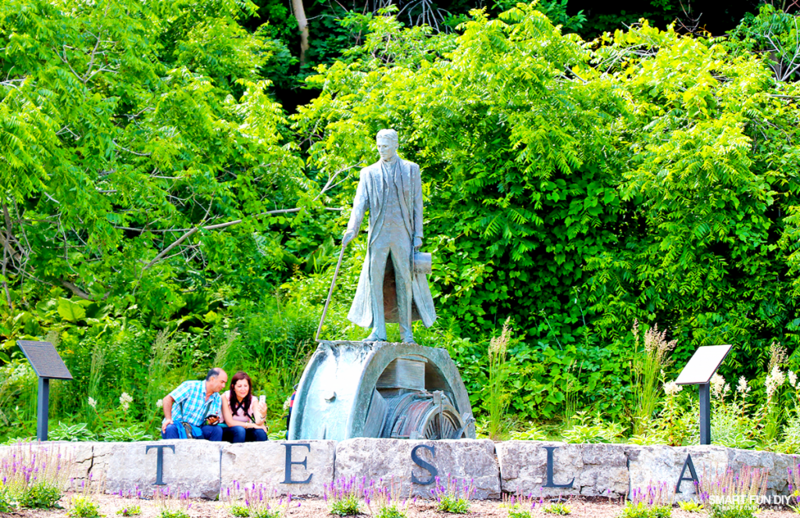 Walk through the lush gardens in Niagara Park (free admission) and check out monuments to Nicola Tesla and other historical points of interest. 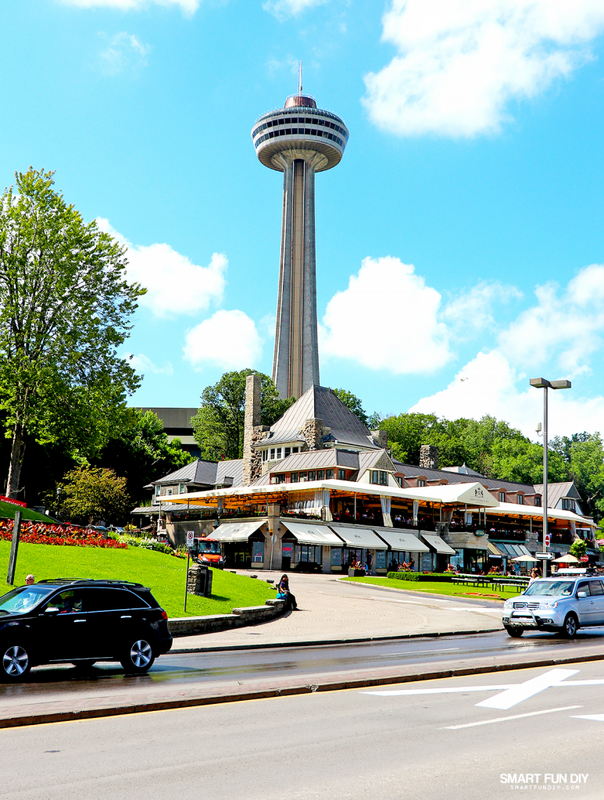 Canada has a thing for towers … Toronto has the CN Tower and Niagara Falls has the Skylon Tower. 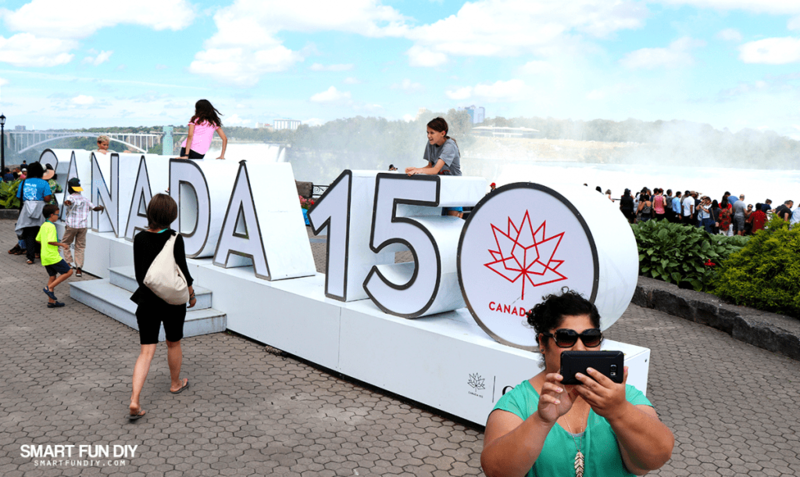 Or snap a photo with the #Canada150 3D signs on display this year for Canada's 150th birthday. We were there for Canada Day so I'll be sharing about that on my Toronto vlog! Since we had to drive back to Toronto the same day and return the rental car before the deadline, we decided to make the most of the drive back north. We had hoped to catch the castle that we heard about from the other conference attendee but it closed at 4PM. So we checked the local area for restaurants, my husband Xaver reading Yelp reviews in the car while I drove. 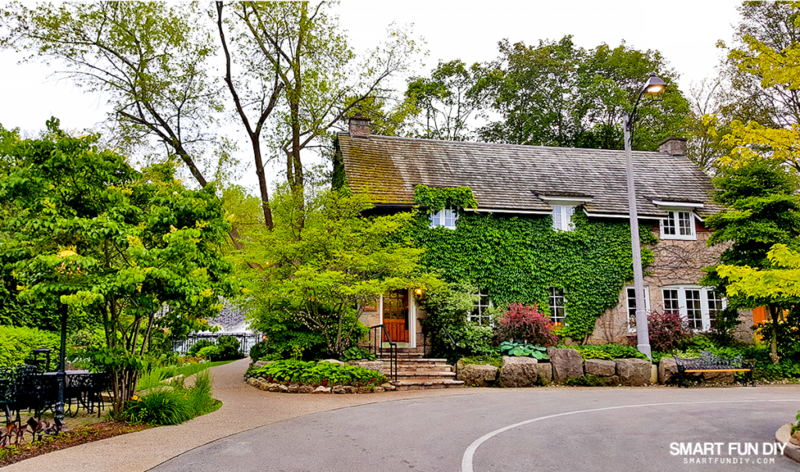 We discovered Ancaster Old Mill, an incredible farm-to-table gourmet eatery tucked in the hills of Ancaster. This meal wasn't a budget friendly choice but it wasn't exactly IN Niagara Falls either. And with all the money we saved skipping the tours, we kinda deserved it! 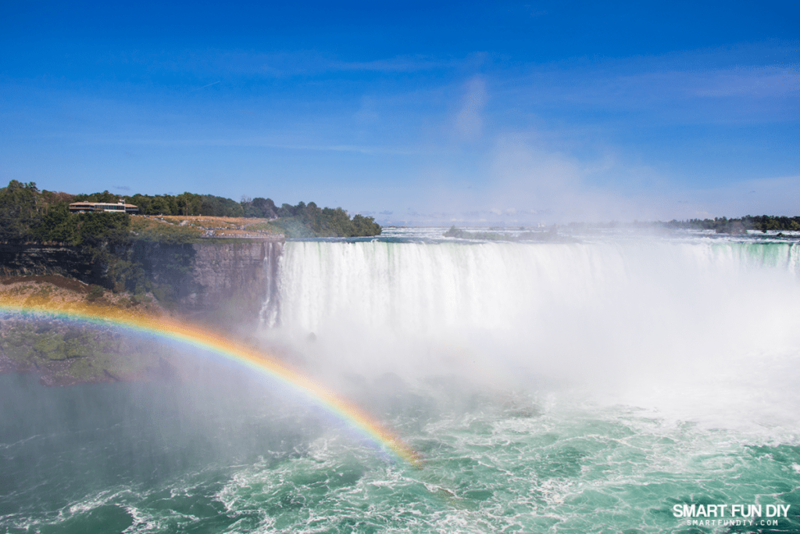 How much does a Niagara Falls trip cost? Our total spend was $80 US which included parking, the rental car, and two tickets for the Falls Incline Railway (I'm not including dinner since it was a splurge). 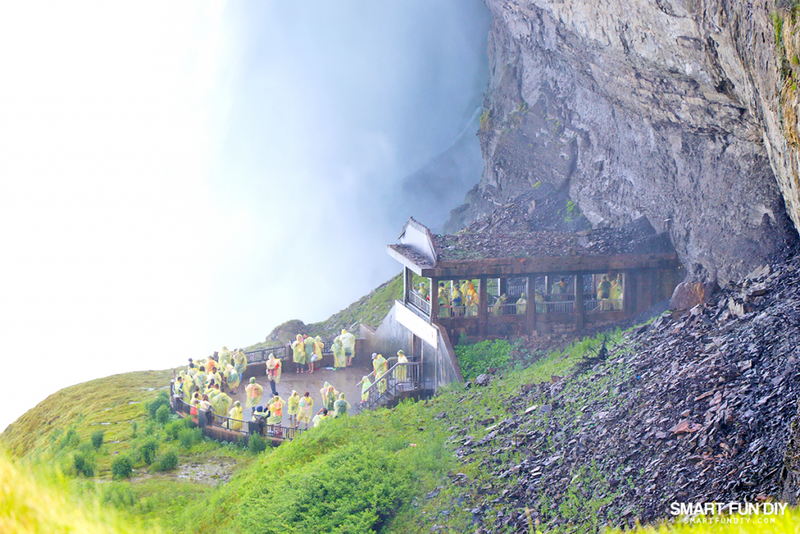 We saved a bundle skipping the pricey tours after we discovered that the best views of the Falls are free (and dry). Where are you going on a trip this year? And do you have a budget travel tip? Candy Corn Water Beads – Halloween Vase Filler Idea! I pinned your post! Thank you! 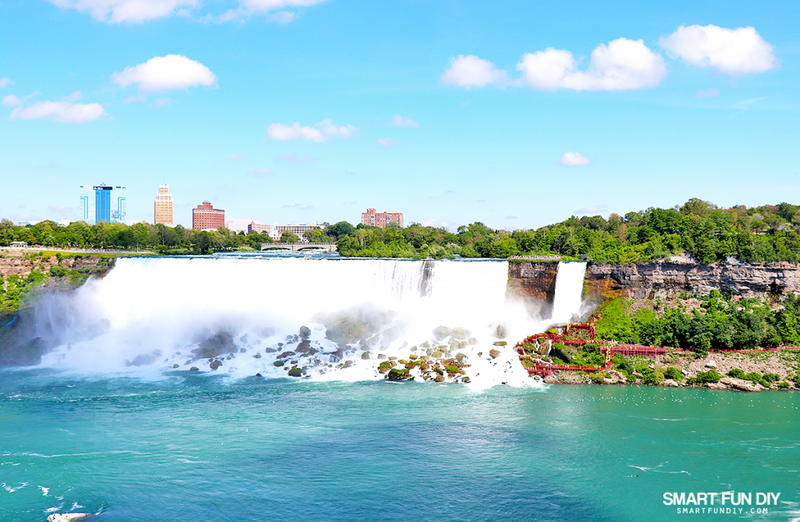 We are heading there quite soon and plan to stay on the New York side.. knowing my boys I will be one of those people getting drenched walking AND boating up to the falls! LOL.